LONDON (Reuters) - Britain will order a review of how police deal with hate crimes after a sharp rise in offences reported following last month's vote to leave the European Union. Almost 6,200 hate crimes have been reported in Britain over the month since the June 23 referendum, which saw immigration become a key issue during a bitter and deeply divisive campaign. The most common crimes were harassment, assault and other violence such as verbal abuse or spitting, with Muslims and Eastern Europeans saying they had been particularly targeted. "Those who practise hatred send out a message that it's ok to abuse and attack others because of their nationality, ethnicity or religious background," interior minister Amber Rudd said in a statement ahead of the publication of a "Hate Crime Action Plan". "We will not stand for it. Hatred has no place whatsoever in a 21st century Great Britain that works for everyone," she said. "Hatred does not get a seat at the table, and we will do everything we can to stamp it out." Critics of the "Leave" campaign say its focus on immigration helped stoke xenophobia and racism, an accusation its leaders reject. In the days following the referendum, the Polish embassy in London said it was deeply concerned about what it said were incidents of xenophobic abuse directed against the Polish community. 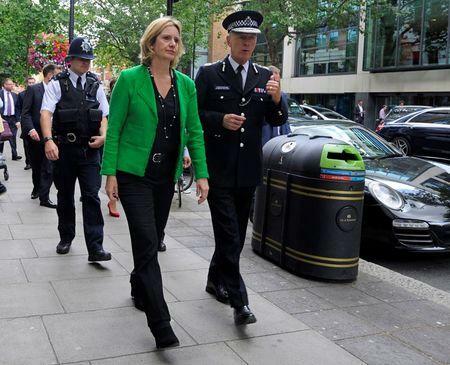 Rudd will announce plans to commission Britain's independent overseer of police, Her Majesty's Inspectorate of Constabulary, to review police understanding of hate crime and how forces respond to it, her office said. The action plan will also set out plans to work with schools on tackling hatred and prejudice and ensuring better reporting of hate crime incidents, as well as looking at how to prevent hate crimes on public transport. The government will provide 2.4 million pounds ($3.14 million) of funding to provide security measures and equipment for places of worship that need increased protection, following concerns from religious communities over crimes from graffiti to arson attacks.